Sanatorium "Teplitsa" is located near the foot of the Black Mountain. The sanatorium consists of 2 three-storey buildings and 9 summer houses. 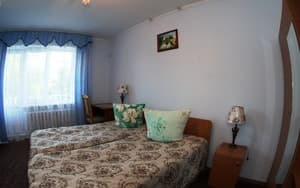 The buildings are equipped with double and triple rooms, in summer houses - double rooms of the "economy" category. Rooms in the summer houses have shared facilities. 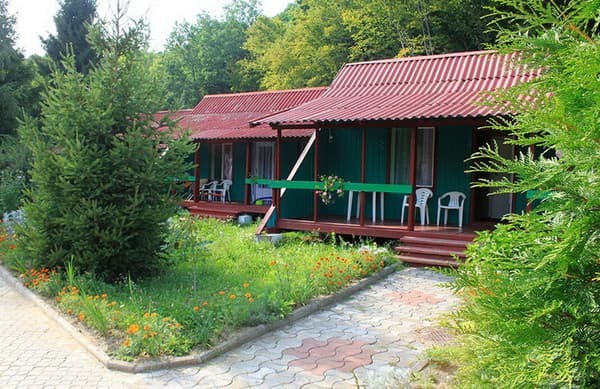 Each building room has a bathroom and a balcony overlooking the forest or mountains. Use of Internet services is possible in the lobby and on the balcony. On the territory of the sanatorium there is a library, a cafe, a cinema hall, a disco and a karaoke show, tournaments and championships, a variety of sports activities are held. You can order food in the cafe or dining room. For the appointment of a doctor, you can order a diet. Guests can relax in the sauna, swimming pool with thermal and mineral waters. Sanatorium "Teplitsa" is located 7 km from the bus station, 25 km from the town of Khust, 65 km from the city of Mukachevo. Description of the room: Double room with balcony and two single beds. 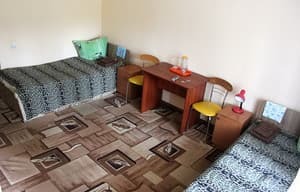 Description of the room: One room is equipped with two separate beds. Description of the room: Cozy one-room with two separate beds on the 3rd floor with a view of the forest. Description of the room: Two-room suite with a large bed. Each room has a balcony with views of the mountains and forest. Check arrival: from 09:00 - 10:00 hours. Check leaving: to 00:00 - 01:00 hours. Children, up to 5 years old, receive a discount of 50%, from 5 to 12 years, a discount on accommodation - 20%, from 12 to 16 years - 10%. It is possible to rent a cot for an additional fee. On the territory there is a cafe and a dining room for 2 rooms with 4 meals a day and can accommodate up to 160 people at the same time. Perhaps diet food, as prescribed by a doctor. Children, up to 5 years old, receive a discount on food at a rate of 50%, from 5 to 12 years - 20%, from 12 to 16 years - 10%. Sanatorium "Teplitsa" is located near the foot of the Black Mountain. The sanatorium is located 7 km from the bus station, 25 km from the town of Khust, 65 km from the city of Mukachevo. Sanatorium "Teplitsa" specializes in the treatment of diseases: musculoskeletal system, gastrointestinal tract, cardiovascular system, peripheral nervous system, endocrine system diseases, upper respiratory tract. Individual diagnosis of treatment is carried out. The thermal waters, mineral waters "Olehovsky", "Kushnitskaya", balneotherapy, SPA baths, electrotherapy, intestinal lavage, heat therapy, sauna therapy, Turkish hammam, massage, singlet-oxygen therapy, inhalation therapy, hydromassage of gums with mineral water, mud applications, aromatherapy and herbal medicine, landscape therapy, climatotherapy, terrenkury, exercise therapy, gymnastics and aqua gymnastics, exercises on simulators, correction of the spinal column, Nordic walking. It is necessary to go by train to Mukachevo, then by bus to Vinogradov. You can order a transfer to Mukachevo. Or, by train to Lviv, and then make a transfer to the passing bus through Vinogradov.